Family in a breakfast rut? 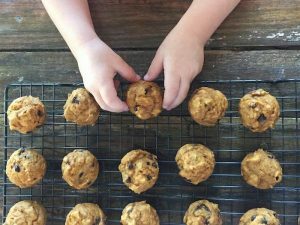 Try making time each morning, eating at the table, and adding protein at breakfast with these fun and delicious kid-friendly recipes. Somewhere between lazy summer mornings, a new house, and a hectic back-to-school schedule, our breakfast routine went awry. I feel like I did a much better job last year of keeping our breakfasts on track. Our mornings looked something like the girls drinking a glass of milk while they wake up and watch a morning show and breakfast in the kitchen before getting ready for school. 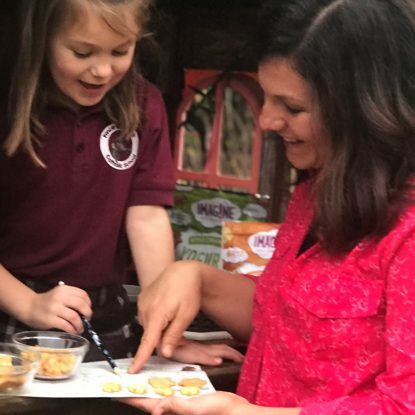 This school year has been much more hectic and often involves eating a waffle sandwich in front of the TV or chomping on some type of granola bar on the way out the door. After a come-to-Jesus with myself, I decided I needed to take back the reigns and get breakfast back on track. While it is tempting to let the girls watch an extra show or color an extra picture so I can sleep 5 more minutes, answer a quick email or check Facebook in the morning, making time to eat an unrushed, balanced breakfast is important. Plus, getting enough protein at breakfast can help the girls feel fuller longer which helps them concentrate and focus at school. Since the girls usually wake up between 6 and 6:30 then watch a show while drinking a glass of milk, I have started aiming to have a set breakfast every morning at 7am. I usually am not serving anything fancy but this helps to keep us in a routine. Plus, it gives the girls about 20 minutes to eat before we rush upstairs to argue about how the clothes we picked out the night will no longer work and brush teeth before heading out the door. In the same way I said in #1 that we need to make time for breakfast, we also need to make sure that we are eating a mindful breakfast. This means bringing meals back to the table because really, they aren’t meant to be eaten on a chair, in a reclined position, in front of the TV. This rule goes for both adults and children. Being more mindful and intentional about WHEN we eat and WHERE we eat leads into #3 of WHAT we eat…. My girls are snackers and if it were up to them, they would forego meals altogether in place of snacks. However, I’ve found that when they pick or don’t eat their morning meal, they are hungry and fussy ALL DAY! The best way I combat the desire for constant snacking is to begin the day with protein to help them start their day off right. 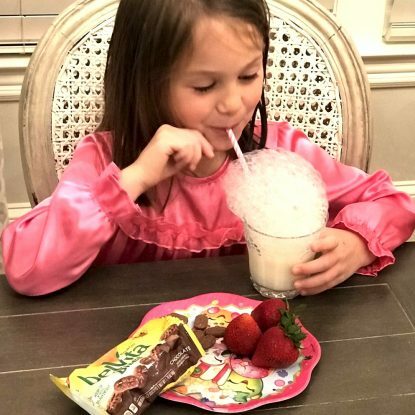 It’s important for kids to get protein at every meal, especially breakfast so I want to share 3 fun and easy ways to boost protein at breakfast that my kids love. 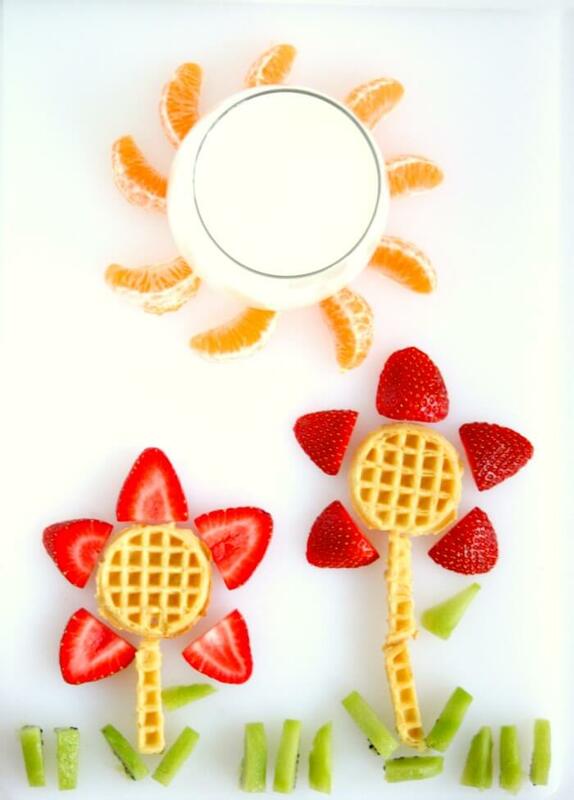 Use frozen mini waffles (or even silver dollar pancakes) and fruit to create a beautiful garden fit for any breakfast. Pair with real maple syrup, peanut butter or strawberry yogurt for dipping and, of course, a glass of milk for 8 grams of protein in an 8 ounce glass. This creepy crawly friend actually comes together very fast and my girls love helping me assemble. So much so that on caterpillar mornings, we don’t even turn on the TV! 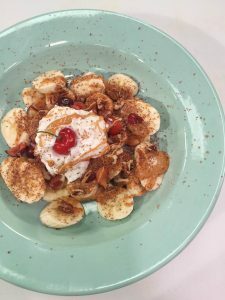 To make, just spread a banana with Greek yogurt then sprinkle or roll in cereal. I like using Rice Krispies or crushed fruity Cheerios because they are colorful but don’t have any artificial colors. 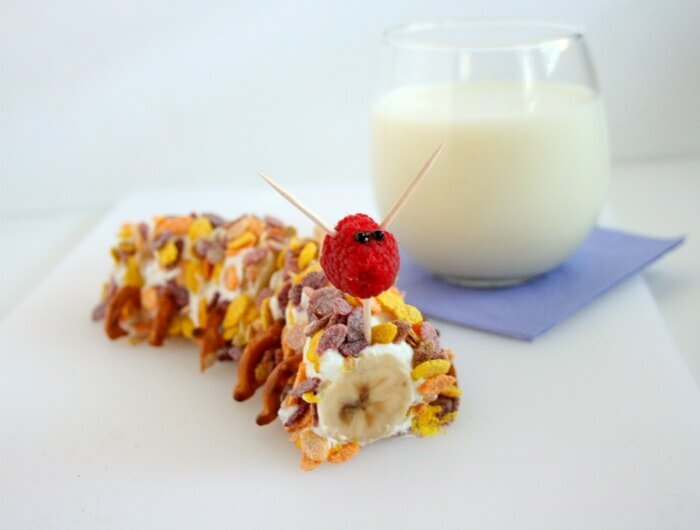 Then use pretzels for legs and a raspberry for the head and serve with a glass of milk. Turn any flavor smoothie you love into a scary monster or a silly Elmo look-alike. 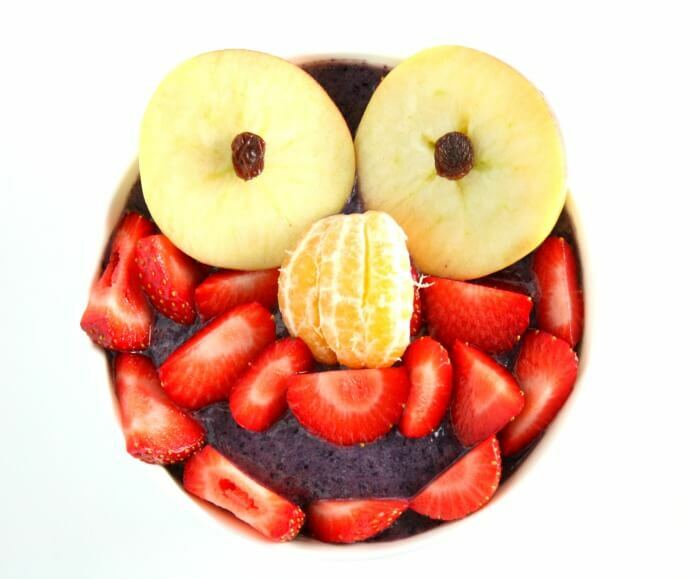 Add your smoothie to a bowl, make a mouth with strawberries, slice apples for eyes and use a mandarin orange for a nose. I used blueberries, milk, frozen banana and (shh!) spinach in this smoothie bowl. Pair any of these tasty breakfasts with a glass of milk for a delicious, simple and wholesome way to give your kids a natural source of high-quality protein plus other nutrients they need like calcium, potassium, and vitamin D. My girls have loved milk since day 1 (their first birthdays) and it is an integral party of our morning routine. Hell hath no furry as two little girls in the morning when Mommy is out of milk! Thanks, Lauren! The girls can be a little choosy so it is fun to think about what they might like that still delivers the nutrition they need. Such cute ideas! I’m all over that monster smoothie! I am so guilty of plopping the kiddos in front of the tv with breakfast so i can run around like a mad woman packing school bags while simultaneously trying to brush my teeth. I am pledging to make more time for sitting at the table for breakfast, even if it means me getting up a teensy bit earlier to get my stuff together. These waffle flowers are so cute! 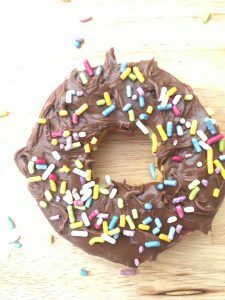 I’m totally going to make these for the kiddos. Great post! I think we all do it despite our best efforts! We’ll have to encourage each other! I agree, I always so I’m going to get up a bit earlier but it certainly is difficult in the morning! The banana caterpillar is adorable! Excellent ideas on how to bring milk back to the table! These ideas are so cute Holley! It’s amazing how kids will eat something they otherwise may not when it’s in a cute shape or something fun they put together themselves! They do eat it cold. At their old school, the teachers would heat it but even then, the didn’t always choose that option. My daughter actually likes corn on the cob uncooked–go figure! !–so no problem there. I haven’t seen one like that yet but I sure would like to invent one! 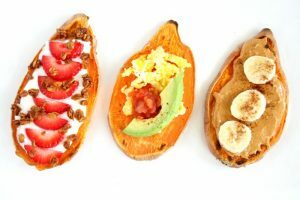 I would just continue to offer healthy options and if snacks are what he prefers then make some snack swaps to either make them less appealing or work them into a meal so that there is a variety of food. 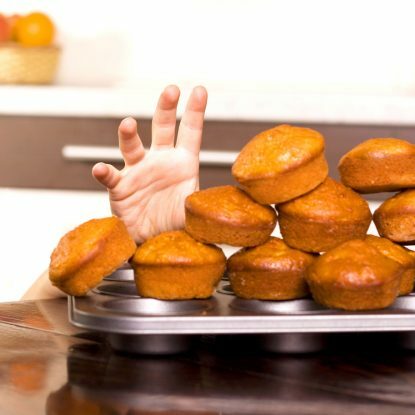 It’s a struggle–I get it! Hang in there!